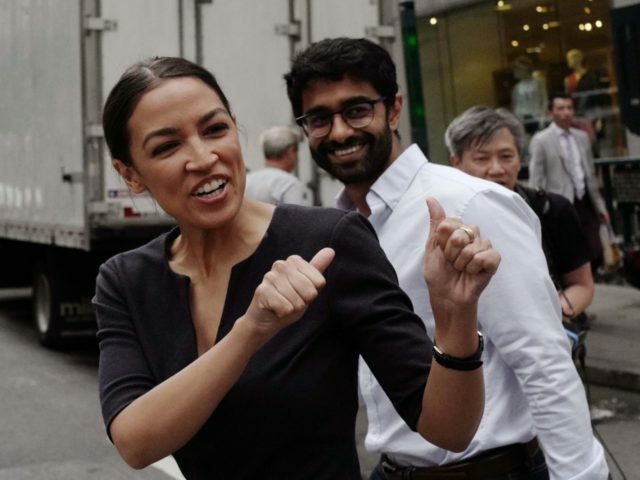 Chief of staff for Rep. Alexandria Ocasio-Cortez (D-NY), Saikat Chakrabarti, is under growing scrutiny for funneling more than $1 million in campaign donations to corporations he owned in 2016 and 2017. “The money that flowed to her chief of staff’s corporation have subjected the first-term congresswoman to critics’ charges of hypocrisy,” reported the Post‘s Michelle Ye Hee Lee. “In a normal situation, if all you saw was a PAC that disbursed hundreds of thousands of dollars to an affiliated entity to pay the salaries of people who were really working for the PAC, that looks [like] a PAC that takes in money to engage in political activity but is actually enriching its owners,” Adav Noti, a former Federal Election Commission lawyer who is now chief of staff of the Campaign Legal Center, told the Post. The National Legal and Policy Center (NLPC) filed a complaint Monday with the Federal Election Commission, alleging that the scheme violated campaign finance reporting requirements. According to the complaint, Chakrabarti established two PACs, the Brand New Congress PAC and Justice Democrats PAC, then systematically transferred more than $885,000 in campaign contributions received by the PACs to corporations he established — Brand New Campaign LLC and Brand New Congress in 2016 and 2017. Corporations, unlike PACs and candidate campaigns, are exempt from reporting or itemizing all of their significant expenditures, and leave hidden who benefitted from the money. David Mitrani, a lawyer for the Ocasio-Cortez campaign, the PACS, and the LLCs, said the PACs did not disclose information about the ultimate recipients of the money because they were not required to do so by the FEC, according a statement. “If the PACs and campaigns were required to provide additional information on subvendor payments made by Brand New Congress LLC, it would have done so,” he wrote. He provided a 2017 contract between the Justice Democrats PAC and the Brand New Congress LLC, that showed the PAC paying the LLC a monthly retainer fee of $60,000. According to the contract, the fee was to pay employees, subcontractors, and agents. The contract shows the primary consultants for the project were Chakrabarti, the LLC’s then-chief operating officer Nasim Thompson, and Corbin Trent, a consultant who is now a spokesman for Ocasio-Cortez. Mitrani has denied that Chakrabarti ever received any “salary or profit” from his corporation, the PACs, or the campaign. The Coolidge Reagan Foundation has also filed another FEC complaint alleging that Brand New Congress PAC was involved in a scheme to funnel money to Ocasio-Cortez’s boyfriend, Riley Roberts, according to the Washington Times. The Coolidge Reagan Foundation said in their complaint that it looked like a shell game. “The timing and amounts of these transactions, the use of two affiliated entities as intermediaries, the vague and amorphous nature of the services Riley ostensibly provided, the magnitude of these transactions compared to both the limited funds the campaign had raised at the time and the total amount of its expenditures, and the romantic relationship between Ocasio-Cortez and Riley collectively establish reason to believe these transactions may have violated campaign finance law,” it said.